JAL offers special services to make it easier for passengers to bring their favorite instruments along for the trip. This page provides information for passengers traveling with music instruments. Passengers hand-carrying instruments that exceed the allowable size for carry-on baggage must pay a special fee and purchase a separate seat. They may be carried onto the aircraft as carry-on baggage. However, please notify JAL airport staff if the length of any of the three dimensions exceeds 55cm, 40cm, or 25cm (45cm, 35cm, and 20cm for smaller aircraft). We will check the size. Please store your instrument in the overhead compartment. Instruments may either be checked as baggage or hand-carried on board. Passengers hand-carrying instruments on board must pay a special fee. Passengers who wish to check in their musical instruments. Please check in your musical instrument at the baggage counter. Passengers who wish to carry their musical instruments on board. Passengers may carry an instrument on board by purchasing a seat for the instrument. Once on board, instruments must be secured in a seat. 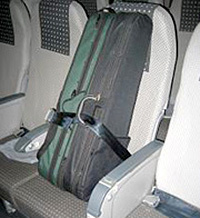 Passengers carrying multiple smaller instruments such as violins or violas may secure them all in a single seat as long as their combined width is 43cm or less. Contact the JAL call center (Domestic Reservation and Information) to reserve an instrument seat. Please note that some instruments may be too large to carry on board. 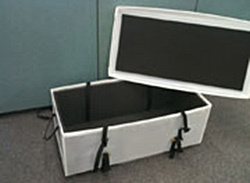 Loaner cases are available free of charge for some types of instruments. * Please note that the numbers are limited, and may not be able to correspond to your request. * This service is unavailable for codeshare flights. 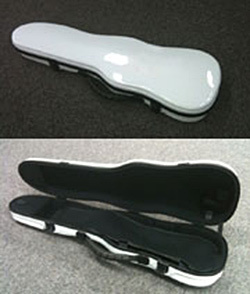 Violin cases of a size allowed for carry-on are available for passengers who wish to carry their violin on board. Even if your personal violin case exceeds the size restrictions for carry-on baggage, you can carry your violin and the bows on board if you carry them in this particular violin case lent to customers for this purpose. Please stow the borrowed violin case in the overhead compartment and check in your personal violin case. They are built to accommodate full-size (4/4) violins. Please speak to a counter representative at the departure airport on the date of flight. Please do replacement by yourself. JAL provides special containers with shock-absorbent cushioning for transporting guitars and small instruments. These containers cannot be carried on board. Large cases for musical instruments as double basses and bass fiddles available for passenger use. These cases cannot be carried on board. * This service is unavailable for RAC/JAC/HAC/J-AIR flights. 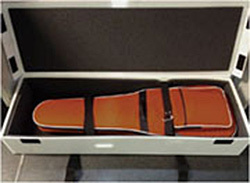 Large instrument cases must be reserved in advance. Contact the JAL call center (Domestic Reservation and Information) at least 48 hours prior to the scheduled departure time.